Are you ready for Purim yet? Got the little gifts for friends? Given tzedakah for the holiday? Planned a festive meal? Decided where you are going to hear the megillah? Or are you having trouble getting in the mood? Yes, the news is full of bomb threats and vandalism. In the United States, there are not many Jews alive who can remember a time when there was so much open anti-Semitism. This is exactly the sort of time for which Purim was made: it is when we feel most threatened that Purim comes to buck us up, to remind us that we’ve seen it all before. Celebrate in spite of it all. That principle is at the heart of Jewish survival. So here are some videos to help you get in the mood for the holiday. Enjoy! Image: A Purim noisemaker to drown out the name of Haman. Photo: Rabbi Ruth Adar. Rabbi Karp, this is so good that I want to be sure to share it with my readers, too. Thank you for an inspiring look forward to Purim. Image: Three members of Temple Sinai, Oakland on Purim: a Chicago Cubs fan, a fool, and a cowboy. Photo by Linda Burnett, all rights reserved. Hard to believe that it’s almost Purim, but the festival is less than a month away. Purim spielers have been practicing for a while now to perfect their silly songs. Those who chant the megillah have been practicing its peculiar trope. Mishloach manot – These are snack package to a few Jewish friends, to help them enjoy the day. I’m going to make brownies and a healthy snack mix, and send them in pretty little cloth bags. Festive meal – I’ve been sick this winter and the house is a little wild, but I’d like to have folks over for the traditional festive meal. I need to think more about that. Gifts to the Poor – Linda and I normally send a donation to the Alameda County Community Food Bank just before Purim. That donation is budgeted and ready. Hearing the Megillah – I will certainly go to the Purim program at my synagogue, and during the day I will reread and study the Book of Esther. I like to wear a silly costume, or at least a hat, on Purim. It adds to the fun for everyone. Not sure I have time for a whole costume this year, but if I’m going to wear a hat, I need to rummage around in my closet! What’s on your to-do list for Purim? Posted on February 23, 2017 Categories Purim4 Comments on Purim 5777: March 11-12! Image: A hand holding a grogger. Photo by Yonina, public domain. And I’ve done the things I do: wrote letters to my elected officials, wrote letters to Jewish community leadership, sent money to organizations that fight hate speech and ignorance. Still, my heart was hurting. I felt blue. I did not feel like going to Purimshpiel last night, but I had promised to be there. And after all, it’s a mitzvah to hear the megillah. So I went. As soon as we were inside the synagogue we were greeted by excited kids and grown-up “kids” getting ready for the Purim show. We admired each other’s silly outfits. I wore a top hat with a big pink scarf knotted around it – not a great Purim costume, but something. I’m so glad I did, because dressing up connected me to the healing silliness of the night. First we gathered in the chapel to hear the Megillah. Cantor Keys did it beautifully, and I got caught up in listening to the story (learning Hebrew really does enrich Jewish experience!) I anticipated the mention of “HAMAN” so that I could cue the roar of groggers. Cantor Keys is a scholar and a cantor, and it was a treat to hear her do the Esther chant with all the little trills and ornaments. It was fun to try to catch the HAMAN’s. There was something therapeutic about the sound of my grogger. It GROWLED. It growled out all my pent-up frustration, all my fury at world events and stupid politicians. It gave a sound to the feeling in my heart. It expressed my anger at all the Hamans in the world. Then we had a Purimshpiel, a crazy riff on Star Wars that made no sense at all, but which had all of us laughing at the ridiculous puns and inside jokes. Purim Wars: The Farce Awakens (at Temple Sinai, Oakland, CA) Photo by Susan Krauss. I woke up this morning with my heart was in an entirely new place. I’m still not at all happy about those things I mentioned above, but I no longer feel defeated by all the evil in the world. I feel ready to fight for goodness and Torah. I will write more letters, I will write an op ed and send it to the paper, I will teach and I will get in faces and I will do what I can. In June, I’ll vote in the California primary. I’m ready to be an agent for good in this world. So, my lessons from the grogger? The obligation to hear the megillah is what got me to synagogue last night. Had I stayed at home, I’d still be feeling blue. Sometimes it is good to be commanded. Groggers are fun, but they are also expressive. My grogger said what words could not say about my feelings. Sometimes we need to get mad. Anger can be a motivator. Haman is all around us these days, but he will lose if we fight him. Evil will only prevail if we allow it. Silly is good. Silly heals. Purim works in mysterious ways! 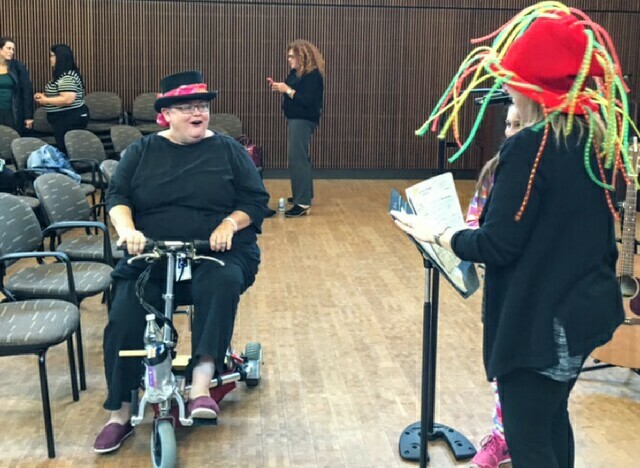 Image: Rabbi Adar on a scooter, admiring Cantor Ilene Key’s great Purim hat! Photo by Linda Burnett.